Translating his vision into reality, our respected Founder, Chairman, MJF. Ln. 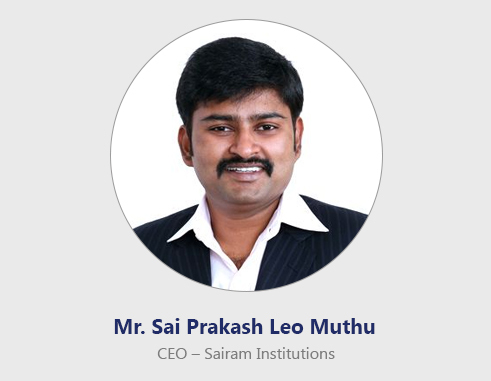 Leo Muthu, has come a long way in offering quality education. Presently encompassing more than 20 educational institutions, Sairam Empire is one of those unique groups which have made its way straight to the top through unrelentless efforts with determination and dedication for quality. Engineering is a vast field that offers infinite specialization. All fields in the modern economy have been invigorated by engineering. Undoubtedly the shape of the modern world has been credited to the advancements in science and technology. A graduation in Engineering opens unlimited opportunities to identify a job, start a business and marvel in research. The involvement and commitment with which the students and faculty have worked over two decades have paid rich dividends and this has made SEC the most preferred one among the pioneering institutions in the state. The students have been consistently securing university ranks in the Anna University Examinations, which has reflected in the placement records as well. SEC is particularly conscious to produce responsible citizens by inculcating discipline and determination. The pride of Sairam is its Alumnus who are well placed in different spheres from civil services to globally acclaimed companies. Our journey moves with the intention of maintaining the ‘legacy’ with lofty goals.